We drove from Texas to Arizona on November 19 and 20, 2005. While enroute, we spent a few hours for a catnap at a rest stop just east of El Paso. We finally arrived in the Sedona area around 2PM on Sunday, and checked into our resort just in time to catch the end of their ice cream social event. We stayed at the Villas of Sedona Resort, which is located just a few miles west of the "Y". 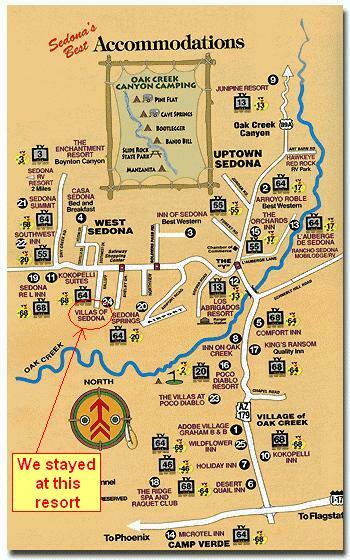 It is located immediately west of (and next to) the Sedona Springs Resort. It is about one block east of Walgreens and two blocks south east of Bashas Grocery Store. One day Elizabeth went shopping at the Art Mart, while Tom and the kids went to a nearby park to shoot baskets and play on the playground equipment. After a few hours at the park, Tom drove the kids back to Art Mart, so they could meet up with Elizabeth and cousins Karen and Dana to go to the movies. The Sedona Cinema is located next door to the Art Mart. While Elizabeth and the kids saw Narnia at the movie theatre, Tom and his brother Greg went for a hike up Airport Mesa and the nearby vortex site. From the top of the vortex location we could see Courthouse Rock and Bell Rock when looking south towards the Village of Oak Creek. After the hike, Tom and Greg met up with their families and we all went out to eat together. Later in the week we visited with Ernie and Mary Beth at the their timeshare at the Ridge. Greg's family was visiting too. Ernie cooked up a wonderful brunch for us and then after eating brunch, the guys went for a hike, while the women went shopping. The guys (Tom, Greg, Jeremy and Ernie) drove over to the south side Red Rock Crossing from the Village of Oak Creek and started a hike up to Cathedral Rock. It was about 3 miles up and 3 miles back. The actual destination was the saddle between the two northernmost spires in the Cathedral Rock formation. Near the saddle was a ledge overlooking Oak Creek and the valley of trees extending west towards Red Rock Crossing. The views were awesome. On Thanksgiving Day we had dinner at Steaks and Sticks restaurant located within Tlaquepaque shopping area. After dinner we took the Christmas Lights tour around the Los Abrigados resort. The Lights Tour was nice, but the weather was quite cold. The wassel at the end of the tour was warming relief from the cold. On Saturday we left Sedona and started our drive back to Texas. We caravanned with Greg's family south down I-17 and I-10 and had dinner together at Cracker Barrel in north Tucson. After dinner, we said our goodbyes and drove back to Houston. We arrived home around noon on Sunday. Click here for pushbutton slide show.